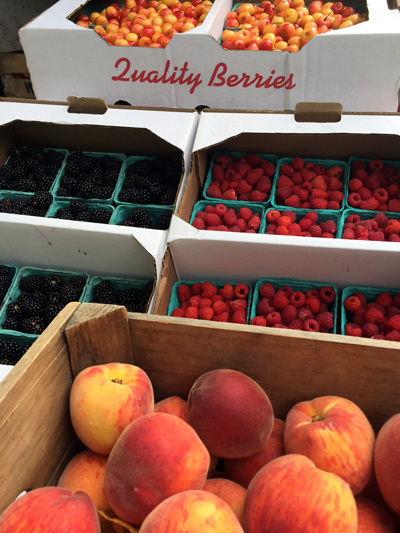 Black raspberries this week are certified organic, from Wholesome Living Acres. From Three Springs Fruit Farm, some beautiful white/gold cherries — which I think are more delicious than the red ones. We’ve also got some gorgeous naturally grown red raspberries from Threefold Farm, and a very small quantity of gold raspberries. More tomatoes! Not a whole lot more, but we’re getting there. More peppers! This week we add poblanos and Anaheims to the mix. We’ve got some roasting to do! PEACHES!!! Need I say more? A few weeks ago, a customer expressed disappointment to me that the eggs in our case had been laid nearly three weeks prior. She was hoping for something fresher. In the moment, I did a poor job of responding. I started to talk about the age of grocery store eggs — which are likely nearly always at least that old, or older — but she wasn’t interested, and understandably. We’re not a grocery store, and we’re not selling commodity food. I’ve spent a lot of time since then thinking about what I wish I had said. The simplest truth is that I have no qualms about selling Village Acres’ eggs three weeks after their date of lay because I have no concerns about the quality of the eggs at that age. I use them myself on a regular basis for all kinds of applications, and — aside from getting an egg laid by a young hen that didn’t quite know what it was doing yet — have never had a problem, or seen any of the tell-tale signs of “old” eggs. I suspect that much of our cultural concern about the freshness of eggs comes from the days before refrigeration, when a couple of weeks really would make a difference in an egg’s quality. In the refrigerator, though, you just won’t see much degradation in that amount of time. On the other hand, we are striving to sell the best food we can find locally, so why don’t we say to the farm, “Hey, we need you to send us fresher eggs”? It’s the word “best”, I think, where it starts to get complicated for me. Certainly there’s no argument to be made that fresher egg is in any way worse, from a culinary perspective, than an older egg (except maybe for hard boiling), so it’s easy to then draw the conclusion that fresher is always better. But beyond the culinary, when we say “best”, we are also usually thinking about a host of other factors — how are the animals treated? where was their feed grown? how are the employees on the farm treated? are they making a living wage? how is the land treated? what kinds of inputs — fertilizers, pesticides, herbicides — go into the growing? how much waste is produced, and what’s done with it? The questions go on and on, but it’s in the first and last — how the animals are treated, and how much waste there is — that I find my answer to this particular question. The thing is, when hens are truly spending most of their time on pasture, their production varies a lot with the seasons. It reaches its highs in the spring and fall, and lows in the heat of summer and the shortened days of winter. Let’s say a pastured hen, in her first year, lays two eggs every three days, or 250 eggs per year. Those eggs, unfortunately, aren’t spread out evenly throughout the year, but might work out to an egg every single day in spring and fall, but only one every three days in heat and cold. Us people, though, want eggs all year round, and in fairly consistent quantities. First would be to increase the size of their flock so that current production is always at least as high as current demand (that is, if you have 100 customers who each want a dozen eggs a week, make sure your flock is big enough that even in the dead of winter you’re getting 1,200 eggs per week). Of course the flip side there is that if you do that, and you’re only selling eggs in the week in which they’re laid, during the peak production times, you’re going to have a lot of waste. Not only does that thought make me very sad, but it’s not going to work out well for the farmer either. In order to do that economically, you’d probably have to cut some corners. By far the biggest cost of raising laying hens is in the feed — even with pastured birds, and especially if you’re buying a high quality non-GMO feed — and that many birds would eat a *lot*. Maybe to make it work, you just have to buy a lower quality feed. That many birds is also going to take up a lot of space, indoors and out. You could probably build a new structure for shelter and laying, but can you buy more land to ensure the hens have ample room to fruitfully forage? As you can probably tell, I don’t like this option — you wind up having to compromise the quality of the hen’s life and eggs, or your eggs are exorbitantly expensive to make up for all that waste. So what’s the other option? You go for a mid-sized flock that lays enough in the spring and fall to generate a little bit of an egg backlog, and you use that buffer to get through the slower times. There’s some guesswork involved, because with a flock too small, you’ll still run short in the summer and winter, but with a flock too large, your backlog might get too big. I can tell you right now that the buffer Village Acres accumulates in the spring and fall is not always enough, and there are a few tense weeks each summer and winter as we wait to see if the hens will lay enough that week to meet the week’s demand. When they haven’t, we have bought in eggs from elsewhere (which, I’m afraid, we didn’t like as much), or passed on price increases from the farm to our customers. I don’t like either of those options — I prefer a little bit of a backlog, and I’m glad that the folks of Village Acres are committed to treating their hens well, providing them with quality feed, and keeping their waste to a minimum.